We're doing great with the first days of school. Sam has started off Kindergarten excited, eager to learn, and blissful about riding the bus every morning. Maddy doesn't know what the heck is going on, but as long as there are snacks, she's happy. I "survived" the first day without chasing after the bus and a long massage session. Getting back into a routine has helped immensely. This includes having Sam start her day off right, and with a sense of having already "succeeded" at something - her Morning Routine Checklist. Art Quilt using hand dyed fabrics and a small sketch of 2 "lovebirds" on a wire. King spiderweb quilt - I go into a little more detail of my "loosey-gooseyness" on this quilt and how it's getting me into a tight spot. BIG ANNOUNCEMENT: I am a "published" quilter now. 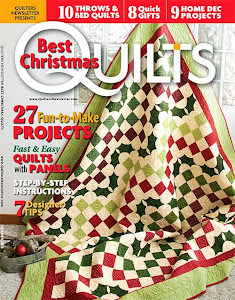 2 of my small projects are in the current issue of Quilter's Newsletters special issue: Best Christmas Quilts. Since I am part of a designer blog hop, I will post more about this on 8/31. Watch this space because QN is running several fantastic giveaways to coincide with the blog hop and magazine release!! Congratulations on being published!!! Hooray for you - can't wait to hear more! Congratulations! I've been eyeing that magazine but haven't purchased as I'm trying to exercise a little self control where magazines are concerned. This may influence me to toss self control out the window...always looking for an excuse! I'm really impressed & happy for you! Congratulations on the magazine project! Having already stolen your selvage Christmas tree idea for a potholder, I need to get the magazine and see if I did it right. Sorry you aren't further along in your spider web progress. Those blocks are pretty labor intensive. I had a similar sad story with mine. Laura, I can't believe you're on your second spider web quilt! I really love the look of this block, but I am pretty sure once I'm done with this one, that will be it for me for good LOL. Aw, thanks so much for listening Jenny. I meant to say I will NOW go square up my quilt. Sorry. I told you I was tired! I like this blog a lot! It is sweet and easy to read. I am going to bookmark it right now! I love both pieces you designed! I'd love to win the fabric to make Christmas gifts. Love these two projects! The Selvage Christmas Tree Mug Rugs and Christmas String. You are very creative! That wall quilt is Sooooo cute!!! And the fabrics you're giving away are gorgeous, as well!! Thanks so much for giving us all a chance at winning them! I would love to win this package; your work is very creative. I love both the Christmas String wall hanging and Selvage Christmas Tree mug rugs! Reminds me that I need to get busy on Christmas items myself! Hey Tanesha, thanks for anther great podcast! Your Miss Muffett analogy had me in stitches :) I think we deliberately don't think through just how much fabric we might need, exactly how big a king size bed is or how long that quilt may take to make because if we did - we'd never start it!! Maybe you could send out fabric to lots of listeners and we can all make you a couple of string blocks? Then it would grow faster! There's a new Kate Spain line out soon too so maybe she'll have colours that go well and you can use that range too. Really enjoying your knitting pics lately too! Thanks for listening Michelle. I am plugging away on my spiderweb quilt - got more fabric, so I should be OK for now. I am deliberately NOT looking at the new fabric lines coming this Fall - I have way too much as it is, and it's all too tempting LOL. Congratulations on being published! That is really awesome!! Thank you for the most recent podcast, just listened to it today. Thank you for the link to the printable checklist, I need to start something like that with my 4-year-old. I was wondering - you mentioned that you have been using workbooks with your daughter to teach her some reading skills - what workbooks have you been using? I've been trying to encourage my son to learn to read, he knows the ABCs and most phonetic sounds, but he has resisted all attempts at reading thus far. Any suggestions would be great! Marisa, hope you got my email with the workbook and readingeggs.com suggestions. Thanks for listening! congrats on your publication!!! awesome piece you made!!! today i listened to your podcast and frankly, during your spiderweb-block talk i DID want to smack you (you asked for it, and no, not really of course!!! :-): just go, get yourself some yardage and finish that thing, woman! other than that it was a great, very funny episode, thanks so much for it! and i definitely will read the hiking book, it sounded great. although i am of the same profession as you i can´t for the life of me recommend books the wonderful way you do.. so thanks for that again. LOL, yes I def. needed a smack upside the head. Thanks for listening! Thanks for the episode and i was so happy as i missed it many a times. I knew there was a reason that we do not have a King-Size bed [besides the fact that our bedroom is to small.] 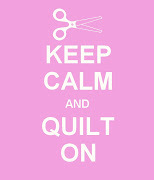 Too much quilt! We have Queen-Size that has a 3 Bali Pop quilt on it and that was enough. Thanks for listening Torie! Wow, you are almost an empty-nester, although it sounds as though your son isn't quite ready to fly the nest yet LOL. Great episode as always, T! Thanks so much for the wonderful and thoughtful review of Abigail Walker!! I appreciate the shout out. Congrats on all your recent successes, including getting a little one off to kindergarten! Tanesha, You have been a busy, busy Mom-In-Chief, artist, and book maven. Congratulations on your wonderful, amazing Christmas patterns/quilts. I also love, love, your...love birds. I remember so very well those first days of Kinder. I think you are good at living in the moment which is good as those school days go very fast.